The energy sector was solid in 2018, according to an industry analysis by Duane Dickson, vice-chair and principal in Deloitte Consulting LLP’s Energy, Resources, and Industrials Industry group. 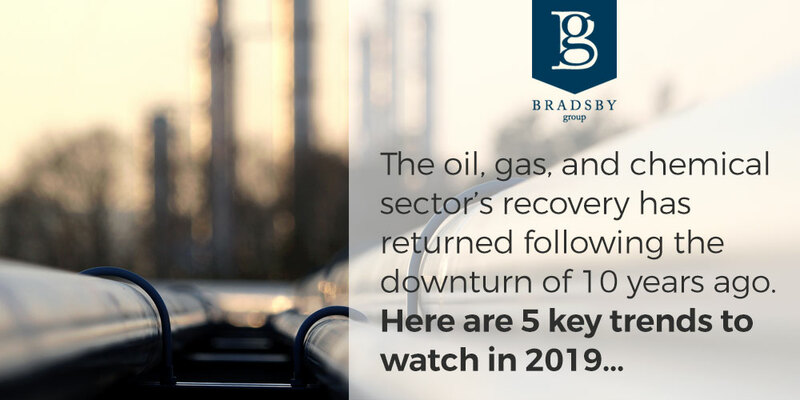 After a brief review of 2018, his white paper focuses on a 2019 forecast for oil, gas and chemicals. We were quite interested to read it because of the partners we recruit for in that industry. Dickson points to leading market indicators to support his conclusion that confidence in the sector’s recovery has returned following the downturn of 10 years ago. Unemployment is low, investment is up, and prices are stable. Tariffs are on everyone’s minds, but even with them Dickson currently sees 2.5-3 percent growth in the near future, while cautioning that if tariffs continue or are expanded, a period of readjustment is certainly possible. In that scenario, the energy sector would be especially vulnerable because of its need for specialized steel for pipelines, refineries, and chemical plants, the kind of steel that most U.S. steelmakers do not supply. Numbers matter. As always, investors continue to care about indicators of returns and profitability. In speaking of the 2018 recovery in commodity prices and learnings from it, Dickson says that disciplines need to be maintained even as costs will eventually rise. Infrastructure matters. If project planning and construction lag behind, the value chain breaks down. Infrastructure must continue to literally support the industry’s phenomenal growth. Natural gas drives growth. The United States is now a major player as economical natural gas gains prominence as a source of low-carbon power generation. Digital tech is increasingly enmeshed in the entire oil, gas, and chemical value chain. This includes integration of AI, analytics, robotics, and blockchain. Taking a 360-degree look, what should the sector embrace in 2019? Dickson recommends four priorities. Embrace maintenance of operational awareness and capital discipline as necessary to sustain returns for investors as well as grow volume. Embrace a perspective that includes dynamics outside the industry, keeping consumer, regulatory, and community concerns at the heart of decision making. Embrace continual adaptation to tech innovations in order to keep every aspect of the supply chain optimally functioning to support growth. And finally, embrace uncertainty. It’s the only certainty. At Bradsby Group we make the effort to keep ourselves educated on the latest developments and trends in the industries we serve. We believe that by doing we can provide the type of insider recruiting services our partners expect – and we aim to exceed their expectations. The entire Deloitte 2019 Oil, Gas, and Chemicals Industry Outlook is available online.